Residents in the Tamfourhill area were evacuated from their homes yesterday after an unexploded bomb was found. Bomb specialists were called out to a house in Brodick Place in the early evening after a member of the public discovered the device, which turned out to be a World War Two shell. Surrounding homes were evacuated as a precaution for around an hour while officers from the MoD’s Explosive Ordnance Disposal team made the device safe. 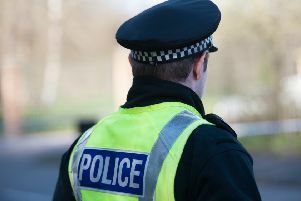 Falkirk-based Inspector Andrew Malcolm said: “We were alerted to a home in Brodick Place, Falkirk, at around 4.30pm on Thursday, August 19 after a member of the public reported the discovery of a suspected unexploded WW2 shell. “Specialist engineers from the EOD were called to assess the situation and the item was later destroyed in a controlled explosion.